I’m in full planning mode for Olivia’s second birthday, which is next month. If you’ve seen any of my Instagrams (I’m new to it – follow me! ), you’ve probably seen some of the things I’ve been working on for the party. 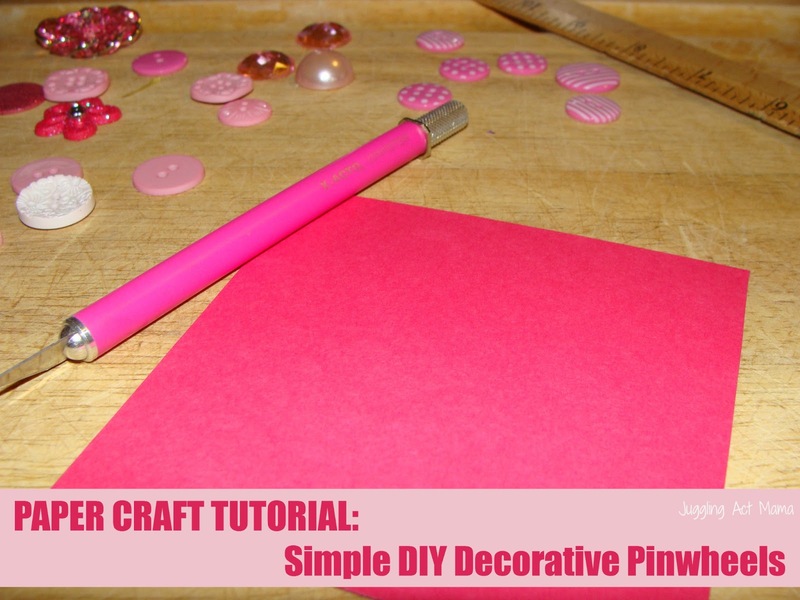 I adore paper crafts, but it never seems like I have the time to scrapbook anymore. 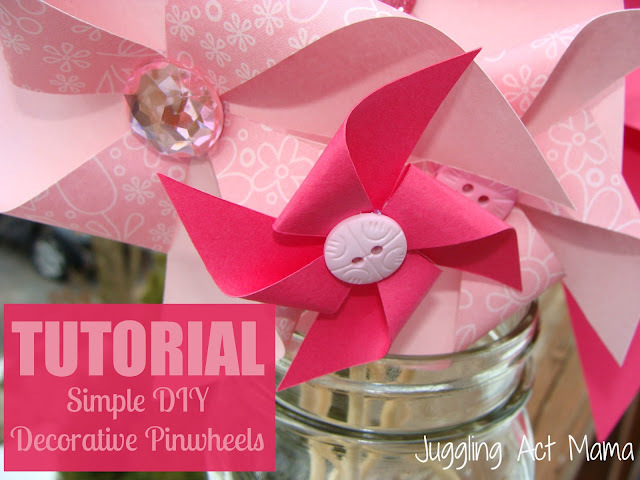 I’ve always wanted to learn to make those cute little pinwheel decorations I see on Pinterest all the time – but honestly, I was a little intimidated. I chose two different papers to make my pinwheels, one solid, and one with a design on one side, and solid on the back. I found a few pretty do-dads in my stash – some buttons and flatback pretties that work perfectly. 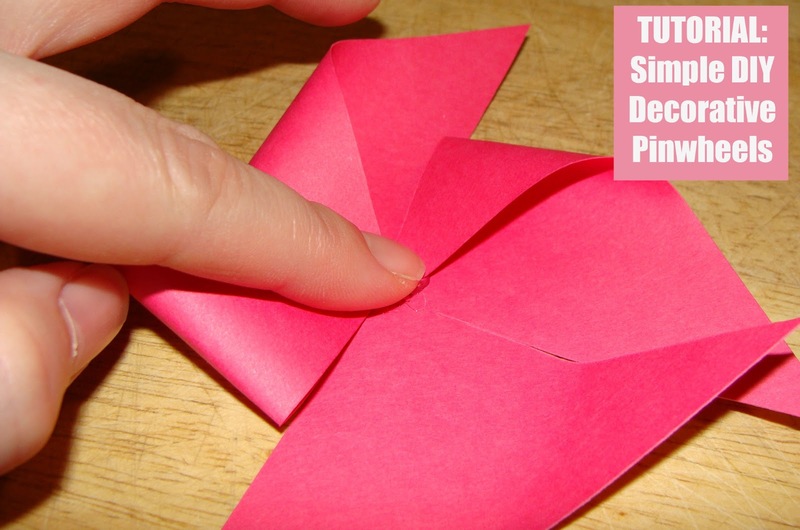 Start by cutting your paper to your desired size. 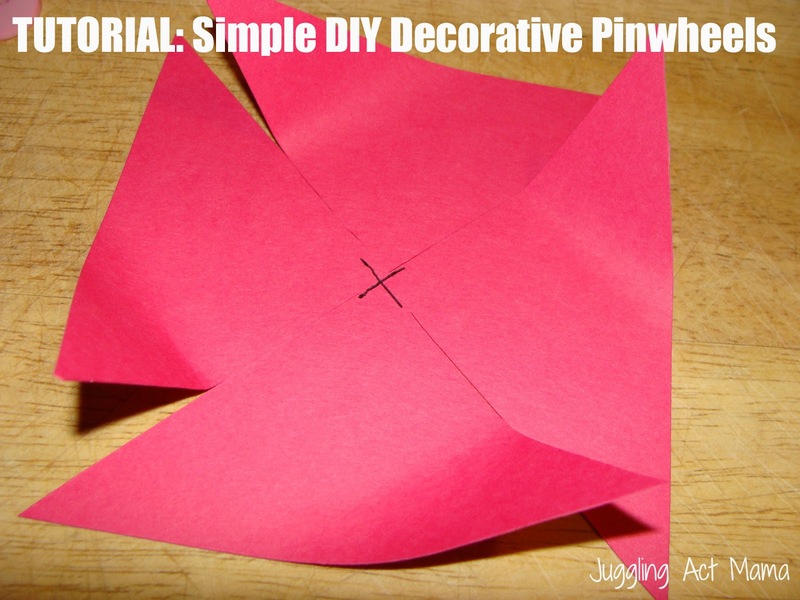 I found that 6×6 was good for starters, and your can get 4 pinwheels out of a piece of 12×12 scrapbook paper by using that size. Next, find the center of the paper, and mark it with a small X. (It doesn’t have to be exact, it’s just a marker for you as you’ll be cutting and folding. I like to gently bend the pieces in toward the middle (like you see above) before securing them with the hot glue. 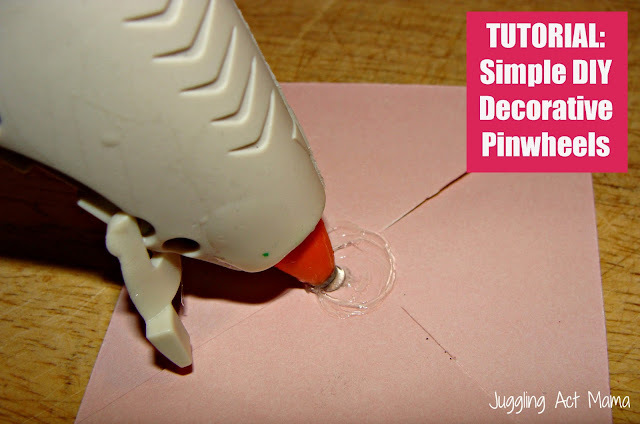 You just need a little thin smear of glue in the center, and you want to work quickly since it dries fast. Be very careful though because you will need to hold the center down a bit and they don’t call it hot glue for nothin’! 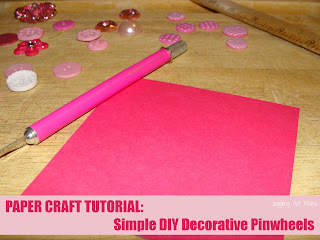 Fasten your decorative centers on with a dab of hot glue and apply a little pressure until the glue sets (10 seconds or so should do it). Use a thin line of glue on the back of the pinwheel and gently press the stick into it. I love how easy these are to make, but they’re so pretty and trust me when I tell you that they’ll impress all your friends! 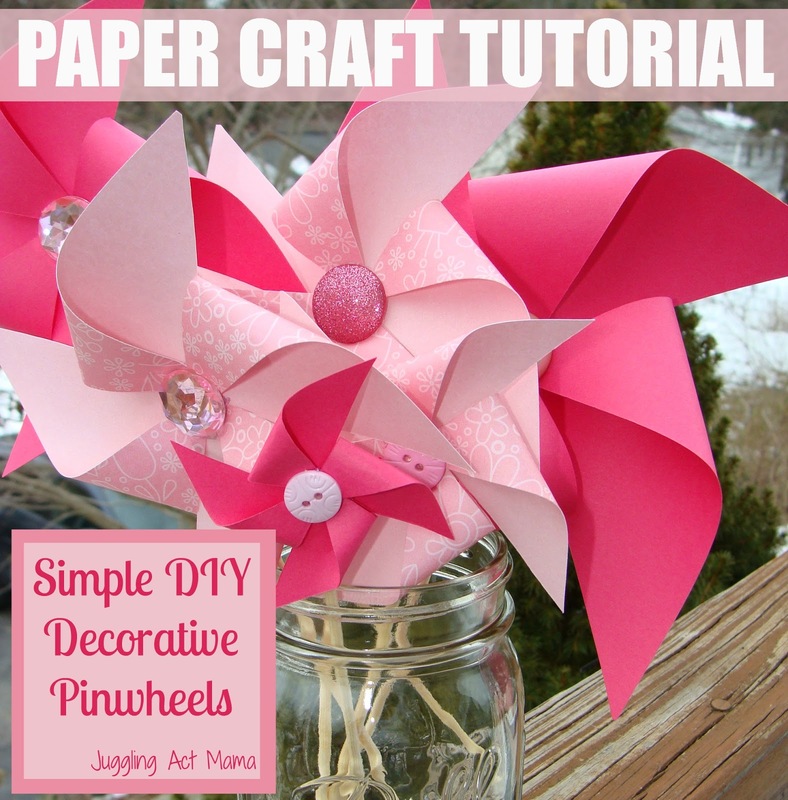 And you don’t have to be having a party to make pinwheels – These would be a nice addition to your Easter table, a sweet gift for your Valentine or for Mother’s Day.